186 pages | 41 B/W Illus. This book distills the practical wisdom of decades of top-quality research and teaching by Phil Shively. The prose and logic are so crystalline that even a rookie can follow every argument, and the advice is so subtle and sophisticated that even the most grizzled veteran can learn from it. Nothing rivals this book as an introduction to political research. 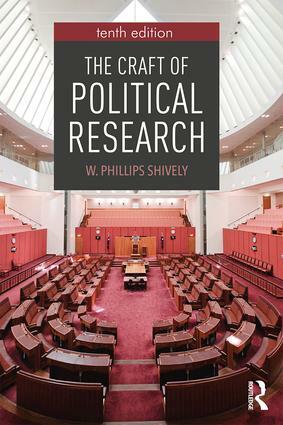 Shively’s The Craft of Political Research has stood the test of time and launched innumerable research careers inside and outside of academia. The 10th edition continues to innovate with critical topics of evaluating accurate information and sources. Most social and behavioral scientists, and perhaps especially political scientists, encounter undergraduates eager to change the world who then face the stark reality that doing the research to know what and how to do so is hard intellectual work. The Craft of Political Research not only provides the tools and understandings to make that transition, but it also does is in such an enjoyable (but technically sound) way that students keep their enthusiasm, tempered with sound judgements about how to make the transition for idealist to sound researcher. Even more, while originally written nearly a half century ago, Shively’s commitment to updating keeps this tenth addition fresh, alive, and current. I was very fortunate to be introduced to The Craft of Political Research in my first semester in college. It has helped to shape the way I think about my own work and others’ for more than 40 years now. With this judiciously updated tenth edition, Shively continues to offer the wisest and most authoritative introduction I know to the logic and practice of political science. The Craft of Political Research remains the go-to introductory text on methods in political science. Jargon-free and accessible it teaches students how to design research and use statistics to answer theoretically important questions. The potential of experiments is highlighted, but the book also shows how to make effective use of observational data. With examples from across the discipline, Shively turns a dry topic into an exciting quest to unlock the mysteries of our political world. W. Phillips Shively is Professor of Political Science at the University of Minnesota, and has also served on the faculties of Yale University, the University of Oregon, and Oslo University, Norway. At the University of Minnesota, he has served as Provost for Arts, Sciences and Engineering, and has also been inducted into the Academy of Distinguished Teachers for his work with students.